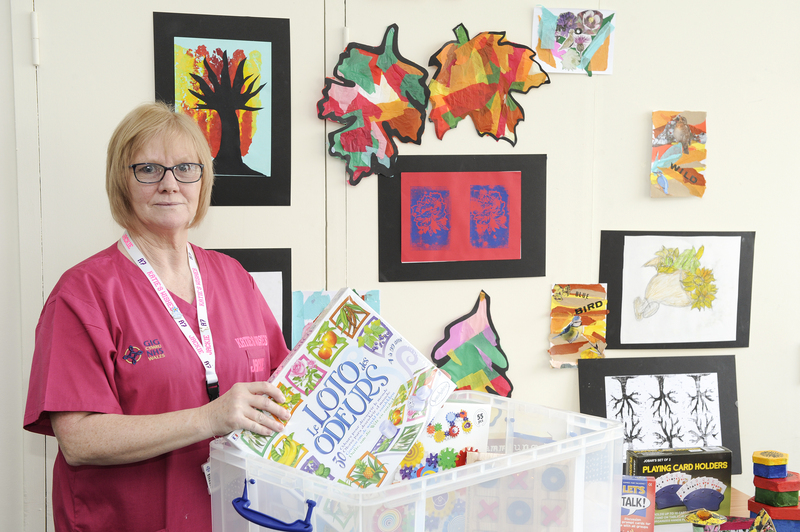 A box of activities for patients who need a little extra support during a hospital stay has been introduced at Cardiff and Vale University Health Board (UHB). Katie’s Wishes is a box of ideas to stimulate, soothe and keep patients active in both body and mind during their stay in hospital. Katie’s Wishes is the idea of Jacqueline Dukes from Ward A7 at University Hospital of Wales (UHW) who came up with the idea from memories of her grandmother Katie. The content of the boxes has been funded by the Cardiff & Vale Health Charity’s Make it Better Fund. Katie’s Wishes activity boxes can be booked out by any ward across UHW or University Hospital Llandough (UHL) to be used by staff, volunteers or one-to-one support staff to help stimulate, support and engage with patients. Katie’s Wishes boxes contain a range of activities including puzzles, games, cards, paints and sensory lights for patients to use and enjoy. Jackie said: “Katie was diagnosed with Alzheimer’s and at the later stage was put into hospital for her own safety. “I remember very vividly visiting her in hospital and seeing all the patients sat around in a circle with table trays in front of them preventing them getting up from their chairs. They were all just sat there with nothing to do, getting upset and calling out for help and comfort. This is a practice not used in hospitals now, but it made me think about what could have made her hospital stay better. “Katie was always busy doing things for others. She loved animals, crosswords and baking, and thinking about the things she liked to do gave me the idea of putting activities in place to make patients’ stay in hospital a nicer experience, as well as helping to keep the body and mind active. Jason Roberts, Director of Nursing for Medicine Clinical Board said: “Jackie has been instrumental in improving the patient experience on A7, from the development of an activity room for dementia patients on the ward, to co-ordinating activities to engage with patients.